The Plot / Story: The second movie in the New Batman series. A sociopath criminal known as the Joker has grown tired of Batman and the changing scene in Gotham city. In the Joker’s ideal city the criminals ran everything and the police would not interrupt their fun. Now that Batman has arrived the confidence of the police and especially new district attorney Harvey Dent is growing and in turn the city is getting cleaned up. 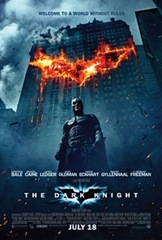 The Joker in turn leads a campaign of destruction to bring back his beautiful city and makes it personal against Batman. I gave the trailer a 4 out of 5. It was intriguing. The Joker looks pleasantly terrifying. The trailer left me with concerns about Harvey Dent. Unfortunately I don't think that they will get back to the spirit of Batman. Batman Begins was a good superhero movie but a terrible Batman movie because it failed to keep to the spirit of Batman. The spirit of Batman is that what makes him a superhero is his industrious, creative, DIY nature. Batman makes his own gadgets and outwits the villains. Batman is a loaner and untrusting of others. I will definitely watch this in the theater. Even though I have been burnt in the past time and again I love Batman and must see if maybe... just maybe got this one right.